“Glacier Table on the mer de Glace, France,” by James D. Forbes (1843), drawn from Nature by Professor Forbes. Frontispiece of his book Travels Through the Alps, which set Louis Aggasiz’s teetch on edge, and influenced Henry David Thoreau’s writing of Walden. This image may have helped him understand how Walden Pond came to be. Geology was front and center during the launch of American Science. The American Association for the Advancement of Science (AAAS) is currently the nation’s most powerful scientific organization. Born on September 20, 1848, the AAAS grew out of its predecessor, the American Association of Geologists and Naturalists (AAGN), which had been formed six years earlier in 1842. In turn, the AAGN grew out of its predecessor, the Association of American Geologists (AAG), which gathered on April 2, 1840 from the broadened residues of Benjamin Silliman’s American Geological Society (AGS), which was organized in 1819 at Yale. Continuing back in time, the relatively new science of geology was born between 1785 and 1795 when Scotsman James Hutton gave a series of lectures in Edinburgh on his Theory of the Earth. The texts of his lectures were published in 1788 by the Royal Society of Edinburgh a virtually intractable book bearing the same name. Fortunately, this was translated into readable prose by his younger Scottish colleague, John Playfair, who wrote: Illustrations of the Huttonian Theory of the Earth (1802). This treatise caught, and then commanded, the attention of a third Scotsman named Charles Lyell, who improved upon, extended, and masterfully argued these new ideas in three volumes of Principles of Geology (1830-1833). No book had more influence on the young mind of Charles Robert Darwin, then a young student being trained in Edinburg, Scotland. Darwin carried Lyell’s Principles with him on board the H.M.S. Beagle, reading them all within before returning in 1835. Henceforth, Darwin considered himself to be a geologist, eventually receiving England’s highest honor in that subject –the Wollaston Medal– only eight months before publication of Origin of Species. That book almost completely eclipsed his previously acclaimed geological work. In 1840 another young man named Henry David Thoreau was also being smitten with Lyell’s ideas, incorporating them overtly in A Week on the Concord and Merrimack Rivers, and then covertly in Walden. Beginning in 1851, Darwin would play a key role in the development of Henry’s Journal, and the emergence of his life as a boatman naturalist. During the colonial years, North American science was focused largely on the physical (i.e. electricity) and medical sciences, largely in the Mid-Atlantic states, and was dominated by thinkers such as Benjamin Franklin, Benjamin Rush,Thomas Jefferson, and Joseph Priestly. But during the decades of the New Republic, geology was the rising science of the day for most. The first geological map of the United States was published by yet another Scotsman, William McClure, in 1809, only two years after the discipline organized itself in London as the “Geological Society.” Returning to Edinburg, McClure published his career-summing Observations on the Geology of the United States in 1817. Two years later, the American Geological Society organized at Yale College under the leadership of Benjamin Silliman, whose main interest was the mineralogy and petrology of local volcanic and metamorphic rocks, and their theological implications. To the north, Reverend Edward Hitchcock of Amherst College explored the stratigraphy and paleontology of the barn-colored Mesozoic rift valley sediments, which included many dinosaur trackways. To the east, Louis Agassiz brought his glacial theory to the attention of Americans when he accepted a position at Harvard in 1847 and began building is natural science program. The American Association for the Advancement of Science (AAAS) was born out of his efforts. Today, genomics and it’s relation to neuroscience holds the distinction of being the “science of the day,” and is now having profound cultural impacts, especially with respect to human racial identity, criminal forensics, stem cell research, human origins, and genetically engineered foods. A generation earlier, however, during the Cold War years of the 1950s-1970s, that distinction was held largely by chemistry and material science, which contributed mightily to the up- and down-side of technology. Physics held that distinction a generation before that, especially during the interval between Einstein’s great year of 1905 and the dropping of nuclear bombs to end World War II. The culture of each American generation was strongly influenced by the rising science of its day. That moment, crystallized his philosophical shift away from theistic Unitarianism and toward a broader spirituality that put nature at the center of everything and natural history as the source of that center. His book Nature, published three years later in 1836, became a turning point in American culture, shifting the attention from received wisdom to the ongoing creation. Emerson’s protoge’, Henry David Thoreau, amplified this strain, writing, “The earth is not a mere fragment of dead history, stratum upon stratum like the leaves of a book to be studied by geologists and antiquarians chiefly, but living poetry like the leaves of a tree, which precede flowers and fruit, — not a fossil earth, but a living earth.” The phrase “living earth” is key. The celebrity of geology eventually fell off its 19th century pedestal, especially in the northeast. 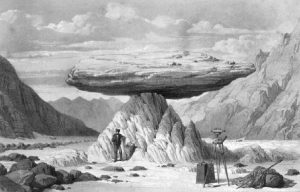 It lingered longer in the west, where John Wesley Powell, Clarence King, Mark Twain and dozens of other writers associated with the western government surveys were embedding geology into the popular imagination, especially in landscape art and anthropology. Geology’s eastern downfall was predictable because all novel intellectual enterprises eventually fall outside the limelight to make room for others. My efforts here are not to resuscitate geology back to it former glory, but to highlight it’s cultural impact on Antebellum America.